Who was it who suggested I cook my garbanzos rather than open a can of them? Maybe it was my friend Stephanie, when she took me on a tour of the fabulous Gonzalez Northgate Market. As I picked up a bag of dried garbanzo beans, she urged me to try them. So, I bought them, kept them in the pantry for a bit, then decided to cook them up for a batch of hummus. There’s nothing to cooking them, just a soak and an hour or two of slow stove-top simmering. Cook your beans according to the package directions. I made mine a day ahead of the actual hummus prep, another easy assembly. Tahini, a thick paste made from sesame seeds, can be found in most supermarkets. I found organic, unsalted tahini at Sprouts, a natural food market chain here in San Diego. I served Larry and his friend a bowl of this after they finished their game of boule, along with a cold beer. 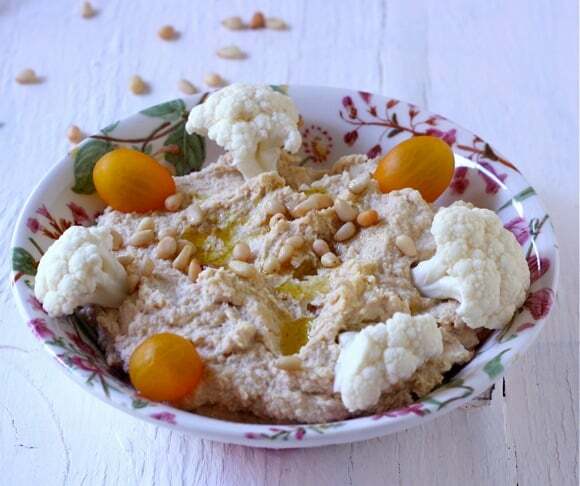 Hummus is great with veggies, chips or pita bread. Homemade hummus made from dried garbanzo beans, rather than canned. Using a food processor, purée the cooked garbanzos, garlic and salt for 20 seconds. Scrape down the sides of the bowl and process for 20 seconds more. Add the lemon juice and water, then process for 20 seconds. Add the tahini and process for 20 seconds. Scrape down the sides of the bowl again. With the processor running, slowly pour in the olive oil. Spoon the hummus into a bowl garnish and serve. It’s a flavor-packed version, new to me from a cooking class I just took, and I’ve been eating it every single day! I’ll give it a try after our vacation – busy packing. I’m going to keep on experimenting. Liz, this looks delish! I love making hummus from dried beans , I think it has more flavor! I think your version with Meyer lemons is close to perfection! Thanks so much – I’d love to see your recipe using some avocado with the garbanzos – and I’d never have the patience to peel them, but it makes sense. I’ve always taken the lazy route with canned garbanzos. I think I’ll try from scratch now. I confess I cook mine from dried form all the time. I almost always have a batch I’ve recently cooked in the fridge and freezer. Congrats for taking the leap!! And your hummus sounds wonderful! I love that you included Meyer lemon juice in yours 🙂 I still haven’t made my own, but keep meaning to. Have a wonderful vacation dear friend. I love hummus! One of my favorite things! I have trouble with dried garbanzo beans (call them chick peas here!) it seems no matter how long I cook them for they remain tough, I wonder why? I love that you sneaked Meyer lemon into your recipe! Do you soak them before you cook them? I boiled mine, then let them soak 2 hours, changed the water and then cooked them according to package directions. I love hummus, especially homemade! I make mine in the Vitamix. I haven’t made it in ages though, so will have to give your dried beans route a try. Using the Vitamix – great idea. Easier to clean and more efficient than my stone age processor. We make our hummus with canned beans (will try dried next time) and chipotle chilies, they add nice mellow heat and a great smokiness.